The real input array this node modifies. The length of input array must be an integer power of radix. Base of the exponent. radix must be greater than or equal to 2. The input array with modified elements. Corresponding index of the input array for each element in the output array. 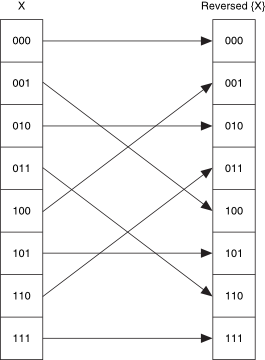 For examples of radix-base digits, 2-base is binary and 16-base is hexadecimal. The following illustration shows the 2-base reversed order (bit-reversed order) of 8 elements.